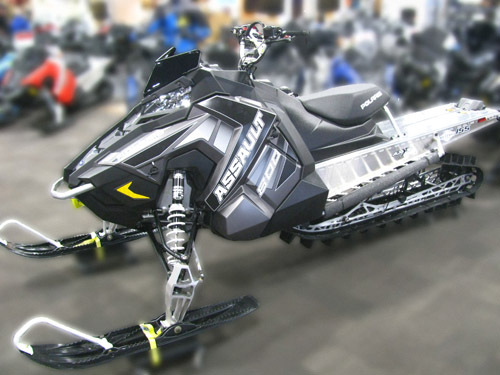 Enter to win a 2018 Polaris 800 Assault snowmachine. Spirit of Alaska is giving away a Mountain Snowmachine! Anyone can enter to win at any of our 3 branch locations. See the machine on display at the Farthest North Outpost! Prize includes a $500 gift card for accessories from the Outpost. 1. No purchase or loan funding necessary to enter or to win. a. Finance any closed-end consumer loan, mortgage loan, open a new credit card or new membership or checking account with Spirit of Alaska FCU during the contest period and be automatically entered for the drawing. c. No other entry methods permitted. Maximum of 3 entries allowed. The winner will be randomly selected from eligible entries. All entries, regardless of entry method become the property of the credit union and will not be returned. a. A single winner will be chosen by the credit union from among eligible entries on April 1, 2019. The winner will receive a new snowmachine along with a $500 gift card. Spirit of Alaska FCU may substitute a comparable prize if the announced prize is unavailable. The winner is responsible for the pickup and delivery of the snowmachine. For automatic entries, the new loan, credit card or share accounts must be opened by March 31, 2019 and all other entries must be submitted to a local branch by this date. b. You need not be present to win. Winners will be notified by telephone. All prizes will be awarded. If the winner fails to claim a prize within 14-days after the drawing or declines the prize, an alternate winner will be chosen. For a list of winners, send a self-addressed stamped envelope to Spirit of Alaska FCU, 1417 Gillam Way, Fairbanks, AK 99701 – Attn: Marketing. a. Actual odds of winning depend on the number of eligible entries received. a. This contest is open to any Spirit of Alaska FCU member or non-member who qualifies under these official rules. Winners must be at least 18 years of age as of March 31, 2019. Open to U.S. residents only. Employees and volunteers of Spirit of Alaska FCU and their immediate families are not eligible to win. a. By entering into this promotion, entrants agree to abide by and be bound by these Official Rules and to accept the decisions of Spirit of Alaska FCU. Entrants also agree to hold the credit union and each of its officers, directors, employees, members, representatives, and agents harmless from any liability arising from participation or the acceptance of a prize. Spirit of Alaska FCU and each of its officers, directors, employees, members, representatives, and agents are not responsible for any negligence, claims, liability, injury, property loss, or other damages of entrants and/or winners arising from, or in connection with, acceptance of prizes awarded or participation in the promotion. Spirit of Alaska FCU is not responsible for stolen, lost, late, misdirected, damaged, incomplete or illegible entries; or for transactions that are processed late or incorrectly, or are lost or not received due to any reason. Spirit of Alaska FCU reserves the right to disqualify entrants who fail to follow these Official Rules or who make any misrepresentations relative to the promotion and prize redemption. a. By entering the contest, you consent to the use of your name and likeness in Spirit of Alaska FCU promotional materials in any media without additional compensation or permission, except where prohibited by law. For the winner’s name, send in a self-addressed stamped envelope to Spirit of Alaska FCU, Hit the Throttle – Giveaway Winner, 1417 Gillam Way Fairbanks, AK 99701.
a. All issues and questions concerning the construction, validity, interpretation, and enforceability of these Official Rules, or the rights and obligations of entrant and Spirit of Alaska FCU in connection with the promotion, shall be governed by, and construed in accordance with, the substantive laws of the State of Alaska, without regard to its choice of law provisions. i. Any and all disputes and causes of action arising out of or connected with the promotion “Hit the Throttle” shall be resolved individually, without resort to any form of class action, and exclusively by final and binding arbitration under the rules of the American Arbitration Association. iii. Judgment upon such arbitration award may be entered in any court having jurisdiction. b. Under no circumstances will any participant be permitted to obtain awards for, and each participant hereby waives all rights to claim punitive, incidental or consequential damages, or any other damages, including attorney’s fees, other than actual out-of-pocket expenses (i.e. costs associated with entering the promotion), and waives all rights to have damages multiplied or increased. a. This promotion is void where prohibited by law. The winner is solely responsible for reporting and paying applicable state and federal taxes. Spirit of Alaska FCU will report the value of the prizes awarded to taxing authorities as required by federal and state laws. The credit union may substitute prizes of equivalent value, amend the rules or discontinue the promotion at any time. The credit union disclaims any responsibility to notify participants of any aspect related to the conduct of this promotion. Written copies of these rules are available during normal business hours at any credit union branch and on the credit union’s website www.spiritofak.com. Third party prize brands are the sole owner of their names and marks and are not associated with Spirit of Alaska FCU or this contest. b. This contest is sponsored by Spirit of Alaska FCU.